Today's market is not a field of dreams but a scrap heap of disappointments. Market sentiment is broken. There are too many negative headlines and investors are confused. Monday's warning from Lumentum (LITE) crashed the chip sector and knocked Apple for a $10 loss. The company said a "large US company" cut orders significantly. They are prohibited from saying Apple but everyone knew whom they were talking about. We knew just prior to the Apple earnings that the XR was not selling well. We also surmised from their decision to no longer report units sold that the sales trends were negative. This chip warning was the third Apple supplier to warn and that is a pretty good indication that Q4 is not going well for Apple. When the chip sector crashes, it takes the Nasdaq with it. 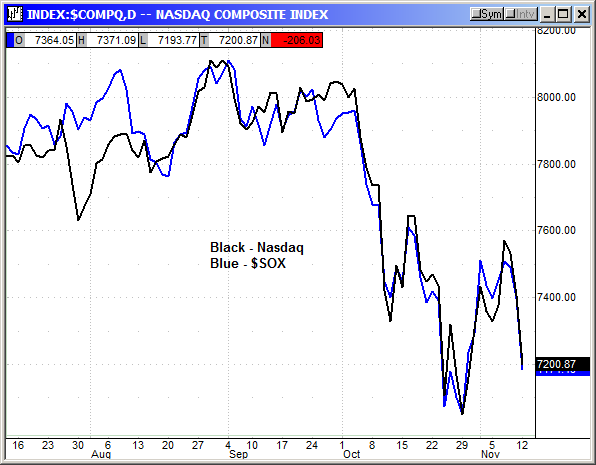 The chart below shows the correlation between the Nasdaq and the Semiconductor Index. Where the $SOX goes, the Nasdaq follows. 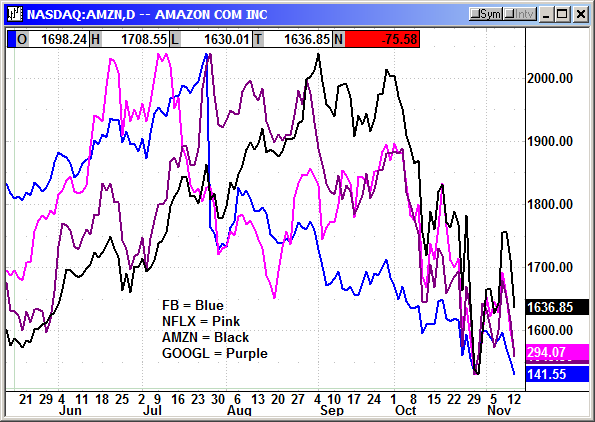 The FANG stocks were also weak. The GDPR rules that recently passed in Europe is costing companies like Facebook and Google billions in security upgrades and lost advertising revenue. If these rules come to America, it will be extremely costly for those companies. The FANG stocks have recently swung back into correlation and they are all going in the wrong direction. The Nasdaq big caps are in a rout. Only three are not in a correction and nearly half are in a bear market. 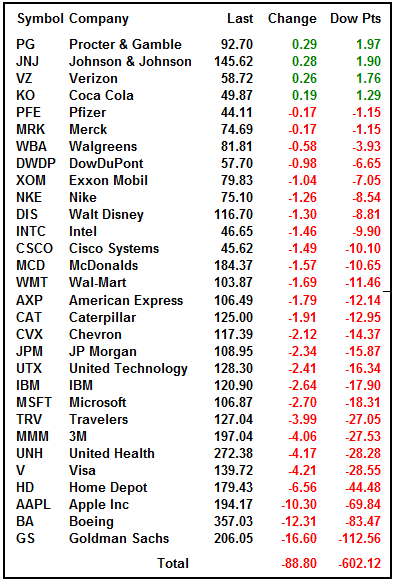 Given the point on the calendar, strong earnings and strong economy, these stocks should be in rally mode but their declines are actually getting worse. Granted, there is always a lot of volatility at tops and bottoms so this could be simply the process of forming a bottom but it is definitely painful. It was definitely a defensive day for the Dow. 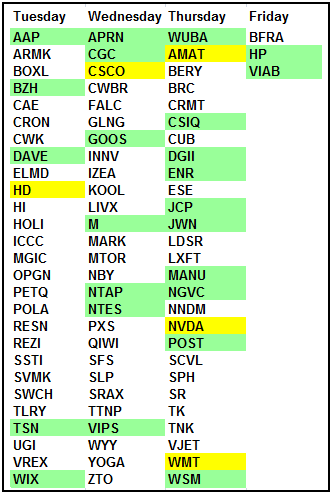 The four stocks in the green are the most defensive plays in the index. Everything was weak including energy, tech, banking, healthcare. There were no pockets of strength other than the defensive stocks. 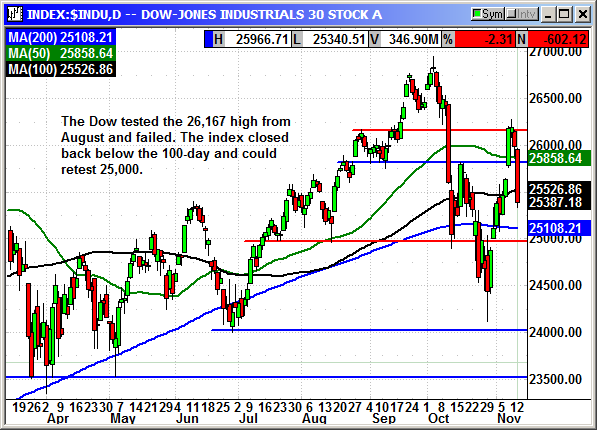 The Dow could be on track to retest 25,000 or worse. 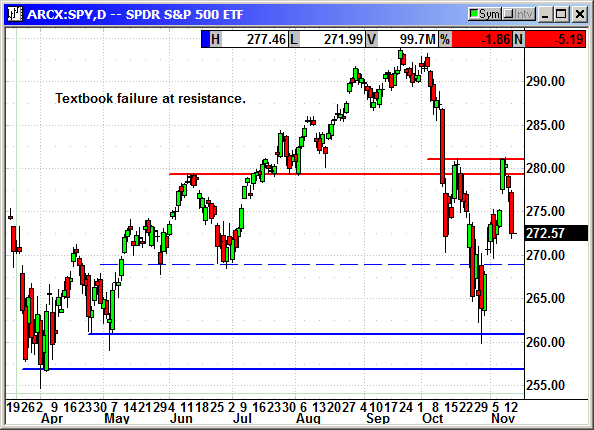 The S&P is a textbook example of a failed resistance test at 2,816. There is decent support at 2,700 but it did fail on the October dip. It would not be unusual for us to retest those lows. The Russell is the weakest index because rising interest rates hurt small caps the worst. The Russell normally leads the market up and down and it is definitely heading lower as of Monday. 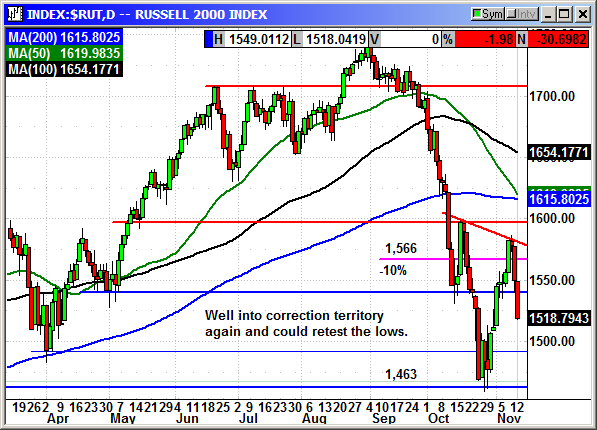 Unless the Russell improves the broader market is going to have a tough time moving higher. Home Depot, Advanced Auto Parts and Beazer Homes report earnings on Wednesday. Cisco is the highlight on Thursday with Nvidia, Walmart and Applied Materials on Thursday. 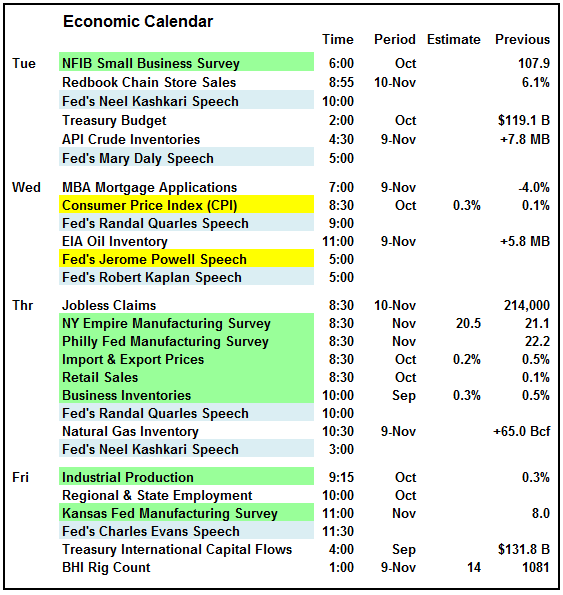 Wednesday is the big day for economics with the CPI and Chairman Powell's speech. Everyone wants him to pull back on the hawkish attitude and provide some hope there will not be four hikes in 2019. Most analysts are already targeting 3 but it would be nice if he could help them get to a forecast for two. The futures have been all over the map tonight and the open could go either way. I would recommend waiting until we establish a positive trend before putting additional money at risk. There is no direction but we have had more negative days than positive days. That suggests we have not seen the bottom or at least a successful retest of the bottom. Be patient there are a lot of trading days left in 2018. The market is broken. There is no trend. Entering a new position after Monday's 600 point decline is just a coin toss. More than 75% of the Nasdaq stocks are in correction territory and the index, actually all the indexes, closed on the lows for the day. I scanned several hundred charts and while I would like to find a diamond in the ashes from the post election decline, I did not find anything I would bet on with my own money and that is my criteria for recommended plays. If I would not put my own money in this market at Tuesday's open, I cannot recommend that anyone else should. The long position was entered at the open on Tuesday. This position went from bad to worse. 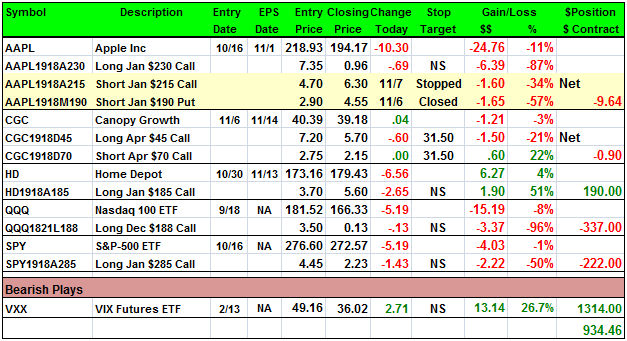 The idea last week was to turn our long call into a spread and claw back some of the premiums we lost when Apple reported earnings. Everything was going well until the market rally the day after the election. The 545 point Dow spike succeeded in stopping us out of the short call and then the stock immediately cratered again. I am going to recommend we do nothing this week. Let's see what the market is going to do this week. It is off to a terrible start but the futures are way up so anything is possible. Original Trade Description: Oct 15th. Apple Inc. designs, manufactures, and markets mobile communication and media devices, and personal computers to consumers, and small and mid-sized businesses; and education, enterprise, and government customers worldwide. The company also sells related software, services, accessories, networking solutions, and third-party digital content and applications. Company description from FinViz.com. Support at $216 held after a minor break and it is time to get long. We know when the Nasdaq recovery begins, Apple will be the leader. Apple earnings are Oct 30th and everyone will be looking for good news about the new iPhone products. Analysts are starting to talk positive about Apple again because of the volume in the new models. Morgan recently initiated coverage with an outperform rating and the second highest price target on the street at $272. The analyst believes the service business is growing faster than people expect and the average selling price will also be higher. He thinks Apple Music will contribute $30 billion in revenue by 2025 and Apple Pay will contribute $6 billion. The average price target is $232.13. On Monday, we had a battle of competing analysts. Goldman said Apple earnings could slow because of rapidly declining demand in China. The analyst said there were signs that overall smartphone demand in China could decline by 15%. For the current quarter they are predicting 80 million iPhones, which includes 16% from China, down from 19% in the year ago quarter. He covered himself saying demand for the big screen phones could offset the revenue loss from slower sales. Also on Monday TF International Securities analyst Ming-Chi Kuo said consumers will be "flocking" to the new XR phone because of the features and lower price. He raised his XR unit estimates for the current quarter by 10% to between 36-38 million. He raised estimates for all models to 78-83 million, up from 75-80 million. He believes the demand for the XR is better than it was for the iPhone 8 last year because of the XRs larger display, longer battery life and new form factor. The $749 phone is cheaper than the $999 starting price on the high-end phones and could attract a much larger upgrade cycle. The phones go on sale on Oct 19th. Shares declined on the Goldman comments and then rose in afterhours on the Kuo comments. Premiums are high because expectations are high. I do not want to make this a spread. I expect Apple to be significantly higher in the months ahead. Because of the high premiums we either have to use a spread or offset the position with a short put. That is the strategy I am recommending. This has risk. If Apple dips under $190, we could be put the stock. In order to prevent that we will be using stop losses on the position. Update 11/5: This is one rotten apple. The company reported earnings and revenue that beat estimates and raised their dividend. Unfortunately, they missed estimates on units sold, issued weak guidance and said they were no longer going to report units sold. That completely angered investors and analysts alike. There are three things analysts want to know when Apple reports earnings and that is units sold, average selling price and service revenues. The units sold are probably the biggest item because that tells you at a glance if the company is growing or shrinking. If they reported 50 million phones in the quarter last year and 40 million this year the answer is very clear. Apple knows this and that is why they are no longer going to report units. Tim Cook tried to make the case for overall revenue as the key because Apple was involved in so many products. Unfortunately, phones makes up 85% of the revenue and all the other revenue from services comes from phone sales. If they did not sell a single phone in Q4, their services revenue would be flat to down due to attrition. Everything revolves around the number of phones sold because each phone is a cash machine for the services subscriptions. On Monday, the Nikkei Financial Daily reported that multiple iPhone manufacturers had been told to halt plans to increase production on the XR and stand down. This followed several reports that the XR sales were facing weak demand only days after they became available for sale. Normally, delivery times are pushed out after a new model is announced and demand exceeds supply. There are no reported delays on the XR. That is a first for Apple. Originally, Apple had planned 60 manufacturing lines at Foxconn just for the XR. They are currently using only 45 and not at full production. Apple shares have fallen $21 in two days. Out long call has evaporated and the short put gained $2. I am recommending we close the put. 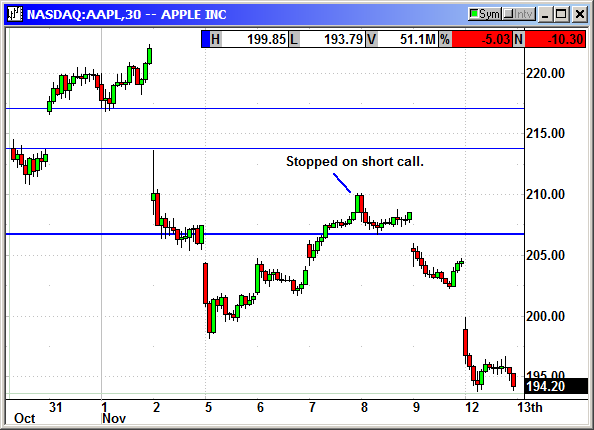 I am also recommending we turn the long call into a spread and sell a short $215 call against it. This will claw back $4.50 in premium and reduce our loss. Analysts are targeting the mid $180s for support. Long Jan $230 call @ $7.35, see portfolio graphic for stop loss. Optional: Short Jan $190 put @ $2.90, see portfolio graphic for stop loss. Short Jan $215 call @ $4.70, exit $6.30, -1.60 loss. 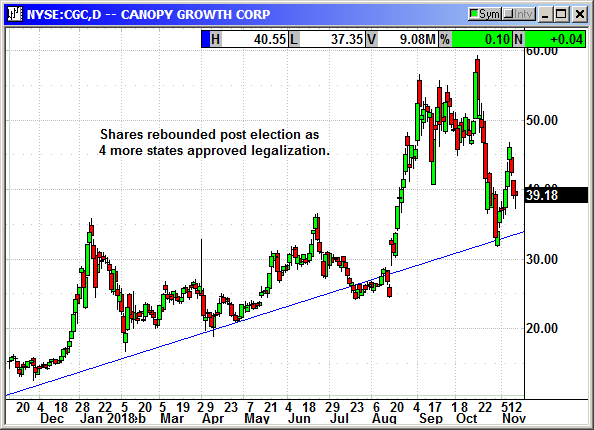 The cannabis stocks rallied after the election because 4 more states passed some sort of legalization rules. On Monday, Aurora Cannabis (ACB) reported a 2,500% increase in earnings and 260% increase in revenue. Active users in the medical cannabis program rose 250% to 67,484. Canopy reports earnings on Wednesday and they should be good. Original Trade Description: Nov 5th. There are three main companies listed on the US exchanges but there are more than 20 listed on the Canadian exchanges. Obviously the US listings will get the most play. Tilray (TLRY) is the smallest with 17.8 million shares outstanding. The other two are Canopy Growth (CGC) and Aurora Cannabis (ACBFF). Aurora has 950 million shares outstanding. Canopy has 228 million outstanding. The recent spike in August was the announcement of a $4.1 billion investment by Constellation. The stock pulled back to uptrend support in the market crash. Canopy has secured supply contracts for about 35% of expected demand in Canada. Marijuana for recreational uses became legal on October 17th. The current US Farm Bill will legalize CBD and Canopy is one of the largest CBD producers in the world. Two additional states have marijuana legalization on the ballot this week and 8 states have already made it legal. In the week after legalization news reports from Canada reported that 50-75% of inventories were sold out. In Quebec the government run stores were only open 4 days a week because they ran out of product. Some brick and mortar retail locations were expected to remain closed until further notice because of supply shortfalls by producers. One online store, Ontario Cannabis made more than 100,000 sales in the first 24 hours. Various government run stores said they were only receiving about 40% of the products they ordered. The supply shortage is likely to last. New licenses to produce marijuana are taking about 341 days to process which will then be followed by the grow time to develop mature plants ready to harvest. Within two weeks of the legalization date in Canada, most pot shops run by the government were completely sold out. This has spiked prices and promises significant profits for growers in coming quarters. Constellation Brands currently owns 38% of Canopy and has warrants that will allow them to take control with more than a 56% stake over the next three years. Canopy filed a notice of material change on November 2nd indicating Constellation would be a 56% owner when they exercise their warrants. On November 1st, Constellation completed the investment of $4.1 billion in Canopy with the option to acquire more. With this $4 billion in cash Canopy is going to aggressively build out additional grow farms, research facilities and infrastructure. This gives them a major edge above everyone else. With Constellation Brands as a backer, Canopy has something that nobody else can match. They have the potential for worldwide distribution both in weed form and in THC infused drinks and edibles. This is going to be so profitable for both companies that I would not hesitate to buy either or both. Canopy has earnings on Nov 14th. With all their product sold out and backorders for their next six months of supply I cannot imagine that they will not post good numbers. The dip back to uptrend support in the market crash is a strong buying opportunity. Long April $45 call @ $7.20, see portfolio graphic for stop loss. Short April $70 call @ $2.75, see portfolio graphic for stop loss. 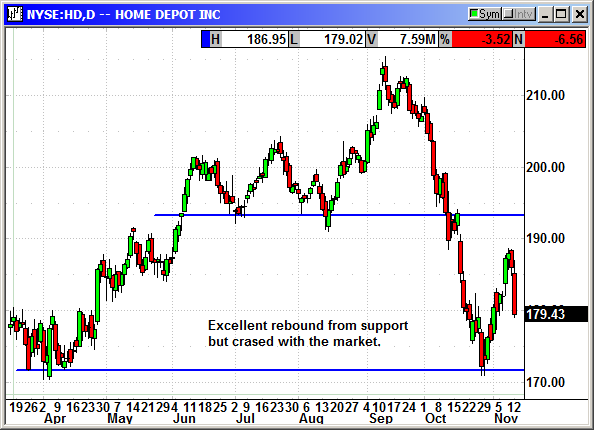 HD rebounded sharply from support but crashed with the market on Monday. Earnings are before the bell on Tuesday. They should be good but it all depends on the guidance and how the market reacts to the news. Original Trade Description: Oct 29th. Support at $172 is solid. I do not want to blindly catch a falling knife but this is pretty strong support. Morgan Stanley reiterated an overweight position with a $200 price target. Several analysts have written that the Sears bankruptcy will benefit Home Depot and Lowe's because of the overlap in store footprints. Since Home Depot sells tools, appliances, household items, lawn and garden, etc, they will pick up any Sears customers looking for a new outlet. 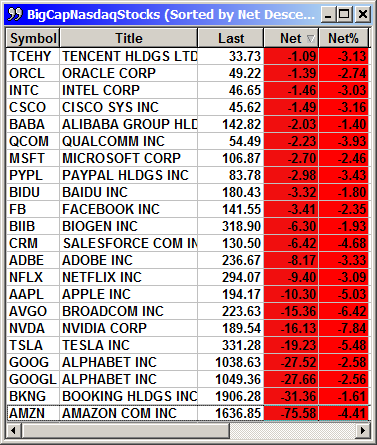 Long Jan $185 call @ $3.70, see portfolio graphic for stop loss. The Nasdaq 100 continues to be volatile, especially with Apple's swoon. We would need a major six-week rally to reflate this position. At the current 13 cents there is no reason to close it. If we could get a week or two of gains, we could sell some calls against our long position to recover some money. Original Trade Description: Sept 17th. 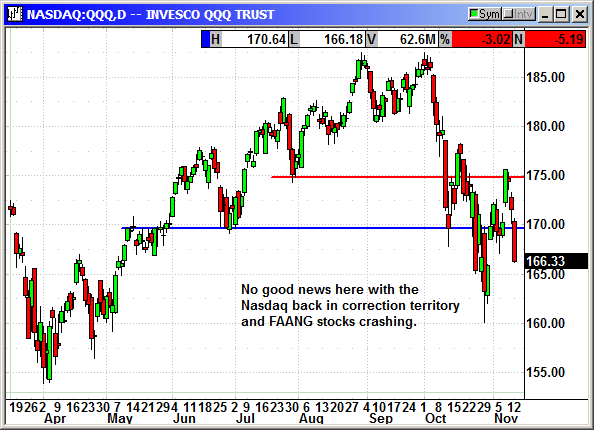 Invesco QQQ is an exchange-traded fund based on the Nasdaq-100 IndexÂ®. The Fund will, under most circumstances, consist of all of stocks in the Index. The Index includes 100 of the largest domestic and international nonfinancial companies listed on the Nasdaq Stock Market based on market capitalization. The Fund and the Index are rebalanced quarterly and reconstituted annually. 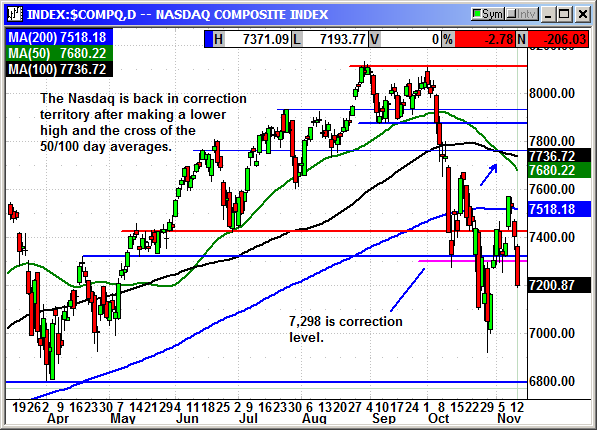 The Nasdaq imploded on Monday with a -114 point decline. 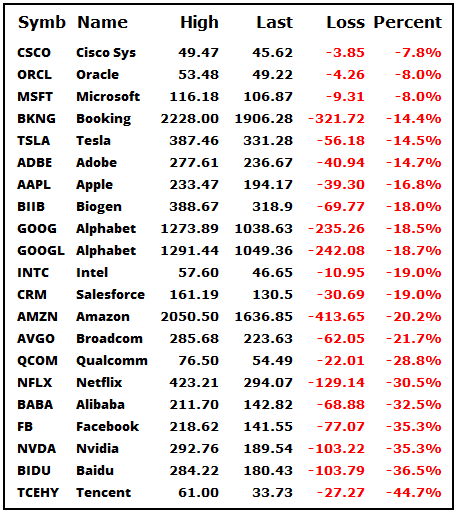 The big cap tech stocks were flushed with the emphasis on the FAANG stocks. Since none of those stocks would be impacted by the $200 billion in tariffs, it was an unusual move. However, we did not know until after the market closed that the president had made exceptions for Apple products and some other important tech equipment like Cisco products. Since we did not know how much the tax would be or what products would be covered, the markets sold off hard into the close. The S&P futures were down over 12 points in the afterhours session but they have recovered to less than -2. The Nasdaq futures were down hard and have rebounded 33 points to currently down -10. I believe investors will buy this dip just like they bought the dozen or so dips in the long list of tariff headlines. Tech stocks are the highest growth stocks and the least impacted by tariffs. I am recommending we buy some calls on the QQQ. If the market manages to make new highs over the next 10 days or so, we could be off to the races now that the big $200 billion shoe has dropped and it looks like it will be ignored. Long Dec $188 call @ $3.50, see portfolio graphic for stop loss. The market is in danger of breaking a 72-year trend. In 18 out of the last 18 mid-term election years, the S&P rallied an average of 10% between now and the end of the year. There was never a losing year regardless of who won the election. A 10% move from here would be a new high. 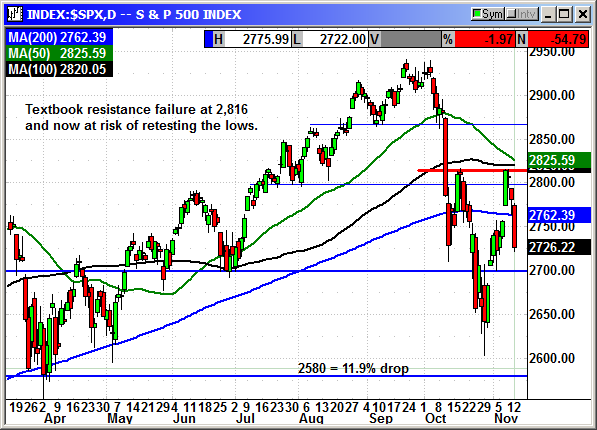 The SPY has pulled back to the 200-day average and just below support at $270. I believe the market is going to move higher during the Q3 earnings cycle. Even if we do not see a Q3 earnings rally the longer-term outlook is positive. The 12 months after mid-term elections have seen the S&P gain an average of 15% for the last 18 midterms. That is 72 years and the S&P has gone up every time. There are almost no trends in the market that repeat 100% of the time. The three quarters starting with Q4 in a mid-term election year average a 19% gain since 1950. With the economy growing at more than 4% GDP, unemployment at record lows and Q3 earnings expected to show 20% growth or better, this should be a good opportunity for the trend to repeat. If we do get a strong rebound rally over the next 3 months that would be 25 SPY points if it only retested the recent high. Long Jan $285 call @ $4.45, see portfolio graphic for stop loss. 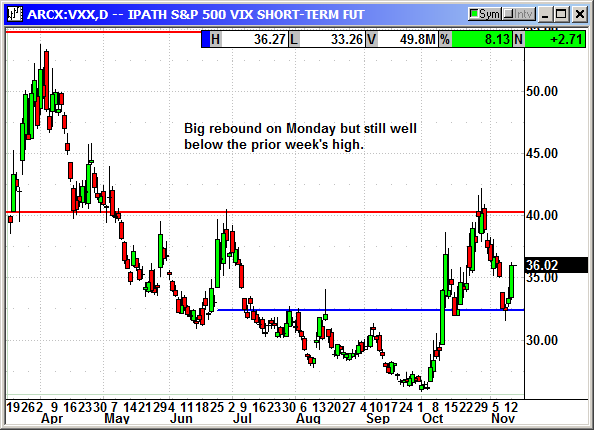 The VXX rebounded nearly 3 points on Monday but remains well under the prior week's high at $42. We need for the market to post several consecutive days of gains to build some investor confidence.